This drill is a situational hockey drill that focuses on a situation that happens too many times to count in the course of a game, The Neutral Zone Turnover. The goal is for defense to go from offense to defense as quick as possible, maintain their gap through good footwork, and stand the forwards up at the blue line. It is a challenging drill for defense. 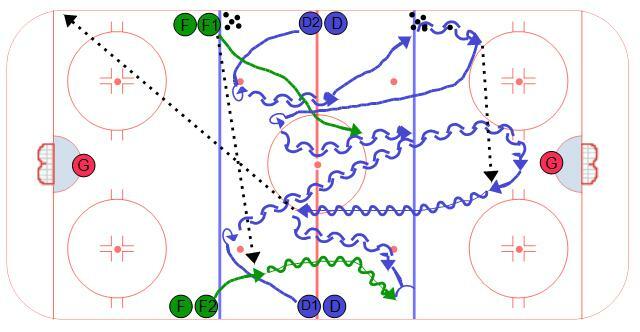 To start the drill D1 and D2 skate up to the neutral zone dots and transition backwards. Just inside the red line D2 opens up to retrieve a puck from the blue line. D1 must be in a good support position to be an outlet for D2. D1 makes a pass to D1 and D1 carries the puck with speed to the red line. The coach will blow the whistle just before D2 reaches the red line. On the whistle, F1 will receive a pass from F2. F1 and F2 then attack D1 and D2 in a 2 on 2 situtation. D1 and D2 try to force a dump or off-sides by maintaining good gap control and standing the forwards up at the blue line.